These distinctive glass plaque awards include six removable blue glass blocks, each of which can be engraved to create perpetual awards or an adjustable leaderboard. 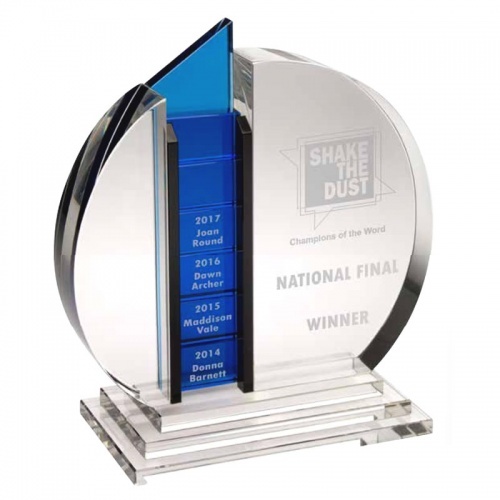 Standing 7.75in tall, the awards comprise a circular plaque made in 32mm thick clear glass, inset with a blue glass column and void which can hold six removable blocks. The whole piece is set on a stepped base and is supplied with a quality presentation case. They can be engraved on the larger clear glass panel as well as the six blocks.